“Magic” Johnson speaks at University of North Carolina Wilmington’s Trask Coliseum as the first keynote speaker of the Wilma W. Daniels Distinguished Lecture series on October 11. Few men in history have lived up to their monikers quite like Earvin “Magic” Johnson. Boasting five NBA championship wins, three NBA Most Valuable Player awards and an Olympic gold medal, Johnson’s basketball career is one of the most impressive in sport’s history. Off the court, Johnson is equally impressive. 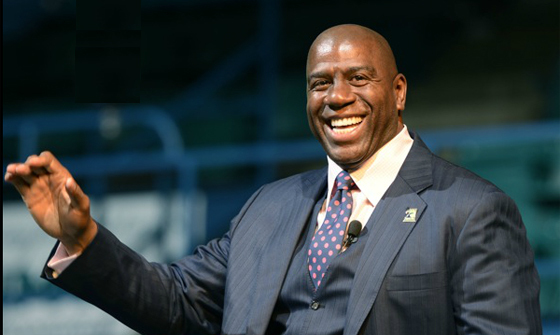 As part owner of the Los Angeles Dodgers and CEO of Magic Johnson Enterprises, a $700 million dollar company, Johnson is a successful businessman, entrepreneur, philanthropist and respected AIDS/HIV activist. 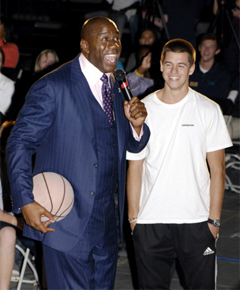 His many accomplishments are what make Earvin Johnson truly magical. Because of his outstanding achievements, Johnson was chosen to be the first keynote speaker at the University of North Carolina Wilmington’s Wilma W. Daniels Distinguished Lecture Promoting Diversity and Tolerance series. Delivering a message about the importance of education, Johnson captivated the close to 4,000 students who who filled the UNCW Trask Coliseum. 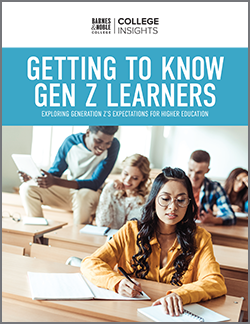 W hen UNCW Bookstore Operations Manager Craig Hewett saw the press release from the Chancellor’s Office announcing Johnson’s appearance, he immediately reached out to the university to see if the bookstore could help. 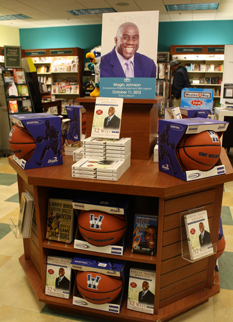 Prior to Johnson’s appearance, the UNCW Bookstore created two in-store displays with Johnson’s best-selling books, UNCW basketballs, UNCW apparel as well as posters promoting his appearance. 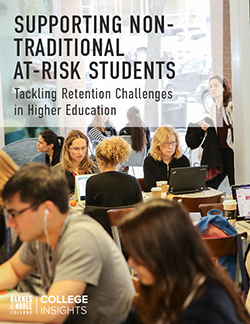 The bookstore also made a promotional video for the event, which was posted on both the bookstore and university’s Facebook pages. With over 600 local middle school students attending the event, the university reached out to the bookstore for help. The bookstore responded by donating brightly colored wristbands inscribed with “Striving to Achieve Excellence” for each student to wear at the event. The UNCW Bookstore is looking forward to working with the university on future lecture series events.